This morning, the Labor Department released numbers showing the economy added 295,000 jobs in , which blew past analysts' expectations of 240,000. The unemployment rate fell to 5.5%, the lowest since May of 2008 - well before the economic crash of that year. 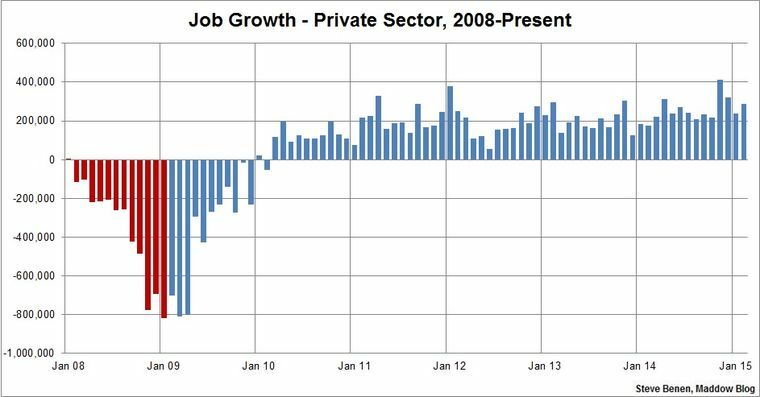 Even more impressive, the private sector has now added 200,000+ jobs for 12 months in a row - a feat not seen since 1977, in addition to continuing the longest streak of uninterrupted private sector job creation in history (60 straight months now, a total of 12 million jobs). The last time public and private sector combined created 200,000+ jobs for 12 consecutive months was in 1984, but it turns out Saint Ronnie couldn't do it without those dreaded government jobs. Thanks, Obama! No, really, thank you, Mr. President. I have said before, and I will say it again: this isn't a freak accident of history. This is a result of deliberate policymaking and backbreaking work by this president - and if Republicans weren't hell bent on kneecapping this president, we would be even better off. Discuss and use as your open thread.